Sweet Stamps is hosting a blog hop to showcase the new stamps that I designed; a collection of florals. Visit each team member's blog and collect a letter. Once you get all the letters, unscramble them to reveal a word. Then return to the Challenge blog and leave a comment with the answer. We will be awarding a first place prize of your choice of 6 stamps from the new release and a second place prize of your choice of 4 stamps from the new release. 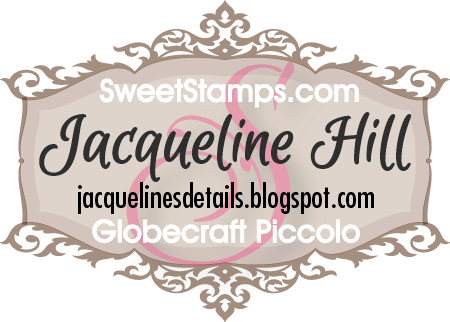 We will also be awarding random prizes of rubber stamps chosen from the readers who comment on each member's blog so be sure to leave some love. Blog Hop winners will be announced on Monday, June 27th before our next challenge. Start your hop with my blog and continue through the team. And don't forget to return to the Challenge blog and leave your answer as a comment. Good luck and happy hopping! I'm so excited to share my new line of stamps with you! I hope you like them. on and off, to get it finished. 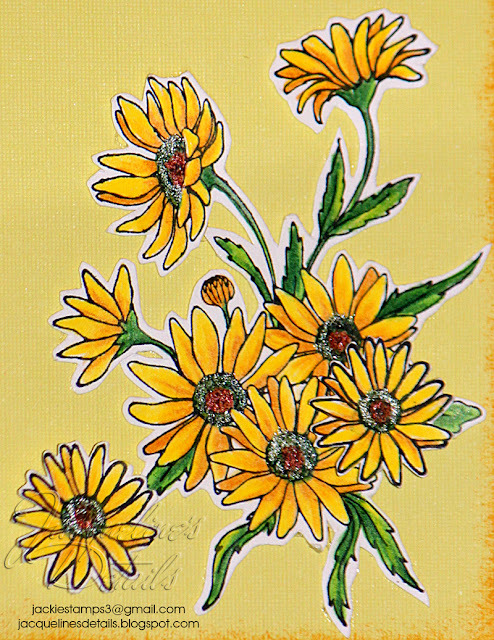 I used pop dots to make some of the daisies stand out. Your card is absolutely fabulous. It really showcases your gorgeous new stamps! What a beautiful card!! First off, I just LOVE the new stamps!! Amazing!! Love all the detail to your card! Love the shimmer!! Aren't the paints fun?!?! I love them!! What a great card!!! 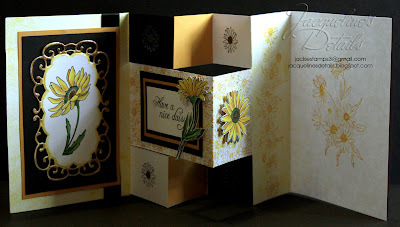 I really like the cut of the card and I just love the daisies! Great Job! Wow, beautiful card. Love the colors used to make the daisies pop! Love the new botanicals and what a beautiful card you made - very striking ! Your card is beautiful, all the work you put into it shows!! 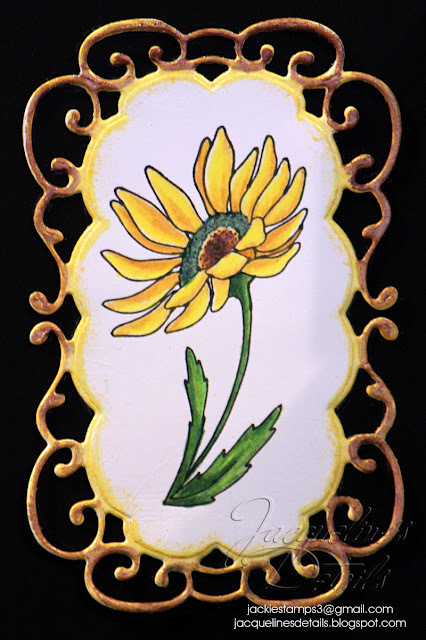 I love the new stamps and will have to check out the inspirations paints you used. Great job. GORGEOUS card!! Love how you decorated it!! The dasies are beautiful! Fantastic job!! Thank you for designing some truly amazing stamps Jacqui! I love them all. Fabulous card too!! Beautiful card. Love all of the details. What a wonderful card. The daisies are just gorgeous. Great inspiration! Thank you. Very beautiful! I can see why it took all week! WOW! Lovely! 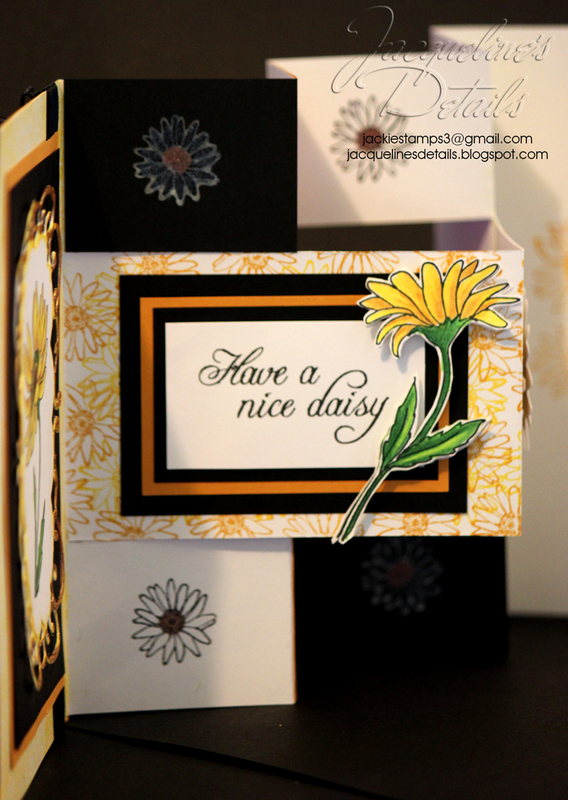 Daisies are my favorite flower so I LOVE this card, so detailed! 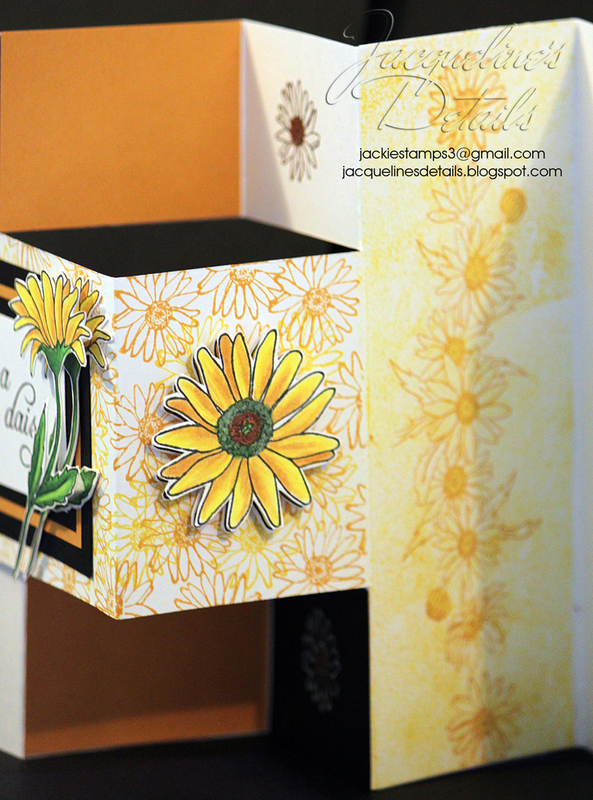 My fav part is the long panel of yellow daisies stamped over and over. What a fabulous sunflower card this is, if the sun isn't shining looking at your card will make it shine! I have never seen this card done so fabulously! Wonderful! This is such a beautiful presentation for all these beautiful flowers. Very pretty, I love the Dasies. I want to try a crad fold like this one and love the backer idea. I can tell your card took a few more minutes than the usual. Using many stamps really showcased your style. I love it! The flowers are so bright and cheery. these are some amazing stamps!! Love the card design as well!! TFS!!! I have been a follower!! Gorgeous, gorgeous stamp collection Jackie!! I love everyone of them and can't wait to ink each of them up!! 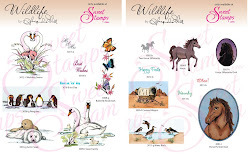 Your card is fabulous and what a brillant card to showcase so many of these beautiful stamps!!! What a gorgeous, with a capital G, card! Love all the details and the time that you put into it.! Gorgeous card! Love it! Thanks for sharing. This is just fabulous!! 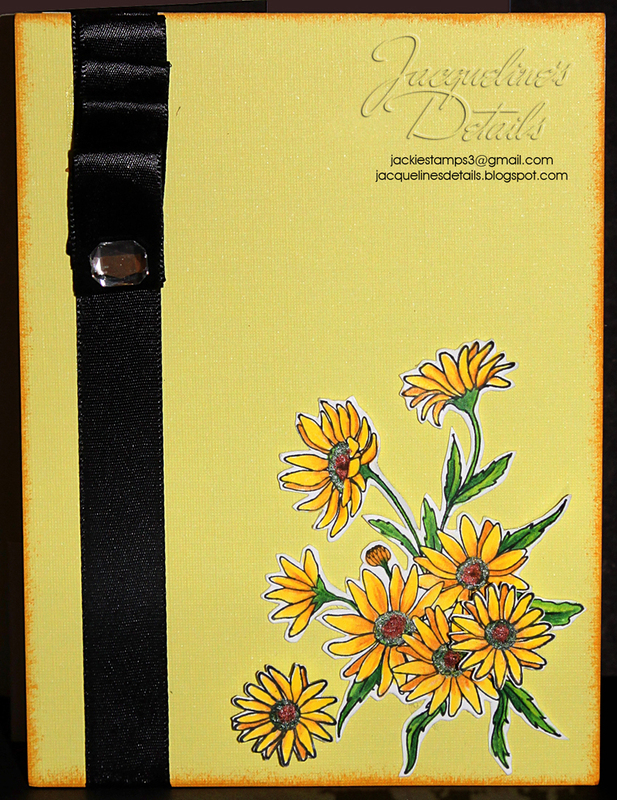 I love daisies and you show cased them very well. Lovely lovely card. Wow This card took alot of work to complete! It's beautiful! Your card is gorgeous. Love he new flower stamps. Lovee the new stamps and sample card! Absolutely beautiful. You are a very talented lady. WOW! a beautiful card and the stamps are very interesting. My favorite flower and can't wait to see more! I have never been more drawn to rubber stamps. can't wait to see more. What a gorgeous design!! You were very brave to try this shutter card. 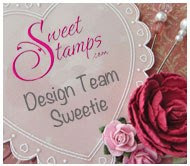 It is beautiful and so perfect for your new stamps. I do love them!! Great job!! What a fabulous card!!! The flowers are absolutely beautiful! What a lovely card. I love daisies and these images are great. What a beautiful card. The yellow is so bright and cheery and those flowers are so pretty. All the detail was well worth it. I have seen several cards made using the same format of cuts and folds, but none so prettily done as yours - love the flowers stamps!